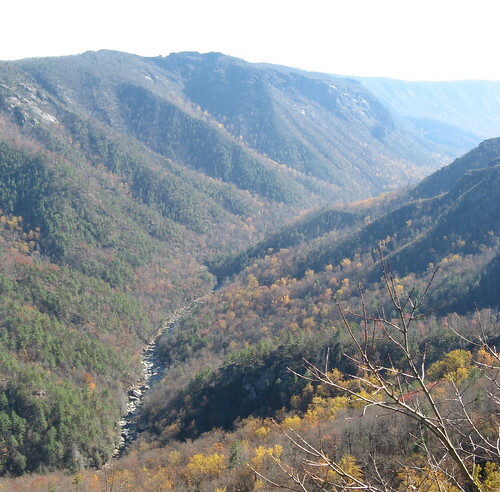 Linville Gorge Wilderness is high on all the must-hike lists for the southern Appalachians. The terrain is so ragged and remote that there was never much prospect of cutting down the trees and putting up swanky resorts. It’s all protected wilderness now, and once you leave the roads you’re on your own. Trails are generally unmarked, except for major junctions and one section of the Mountains to the Sea Trail. 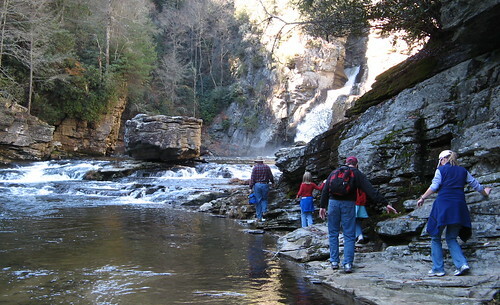 Most of the hiking at the gorge starts high on the rim and dives down to the Linville River at the valley floor. The most interesting hikes are, of course, 14 miles into the middle of nowhere, requiring untold twists and turns on old forest roads — a daunting prospect for a newbie like yours truly. I went for a locale that was easiest to find, and easiest to stay found: Linville Falls Visitors Center, just off the Blue Ridge Parkway (just drive west and I’ll hit it eventually). Linville Falls attracts massive throngs during peak leaf season, but the crowds fade fast once the leaves hit the ground. 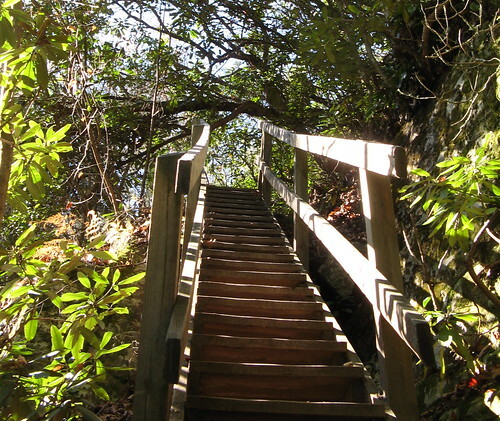 The two sets of trails around Linville Falls are alternately flat and serene or steep and crazy. One eases up to Erwin’s View overlook, with the falls on one side and the gorge on the other. The other zigzags down to river level through a tangle of roots and ragged rock. Both trails are out-and-backs of just under a mile; with side trips and wandering, I notched about four miles. 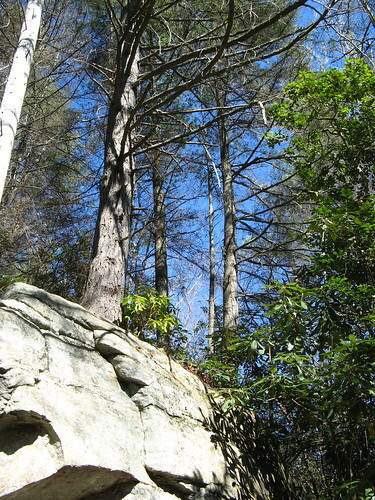 While the easier trails tempt further exploration, the harder ones offer a sobering preview of Linville Gorge terrain: lots of raggedy up-and-down, with high-stepping, low stooping and grabbing branches to keep yourself upright. It can get old fast if your legs haven’t got much scramble in them. Time for pictures. 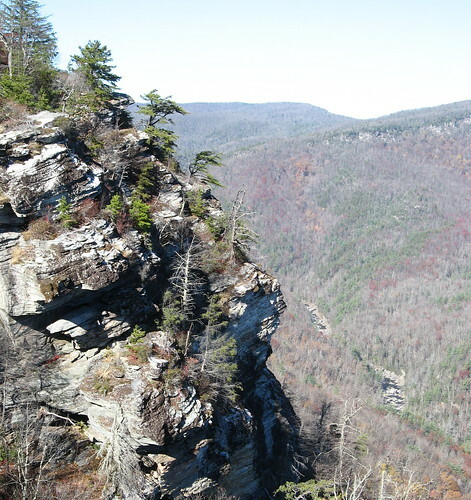 I’ll start with a few pictures of Linville Gorge taken from the Wiseman’s View overlook. This is why they call it the Grand Canyon of North Carolina. Hawksbill Mountain, on the other rim of the gorge. Looking northward into the gorge. The jagged cliffs over there are typical terrain. 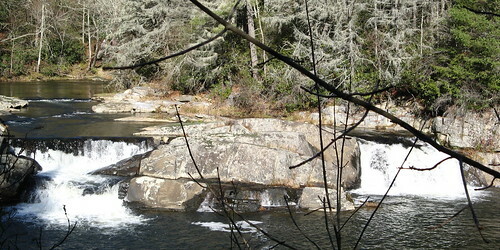 Linville River, just off Erwin’s View Trail — the mostly flat, mostly easy way to see the falls. 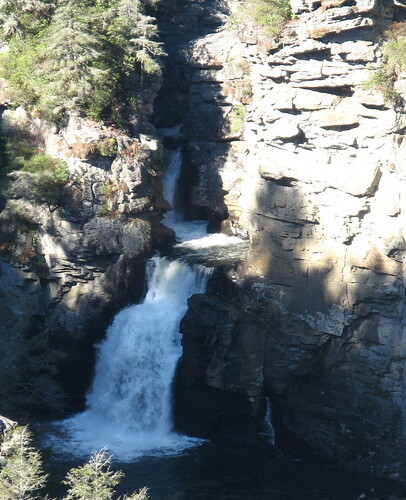 I took this on a tripod with my camera on maximum zoom — the falls are far away enough to make you wish you could get a lot closer. Fortunately, you can. But not easily. 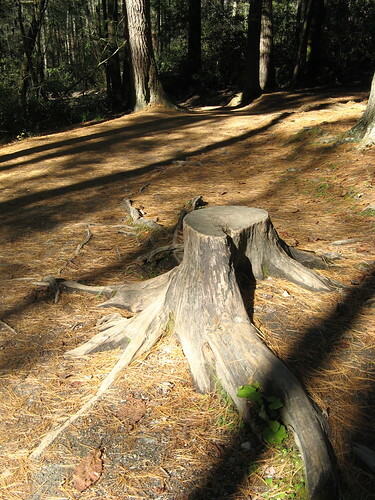 I liked the shades of brown on the forest floor here. OK, so after checking out Erwin’s View, I returned to the trailhead and set out on the Plunge Basin Trail, a much more adventurous route. 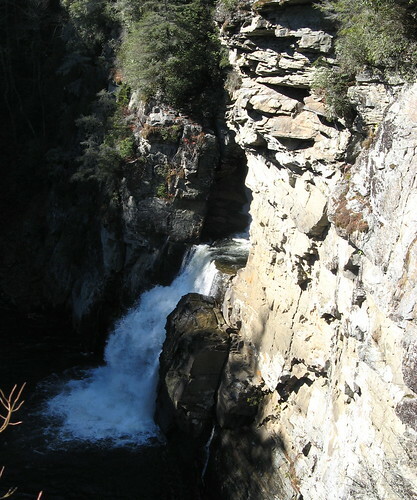 The Plunge Basin at the bottom of Linville Falls is less than a mile from the trailhead, but the wacky footing made it feel three times longer. At the first Plunge Pool overlook, you’re notably closer to the falls than any of the overlooks on the river’s opposite side. (I dropped my camera near here; it skidded along solid granite for a dozen feet, but still worked despite the jolt. Dang thing has nine lives. Fedak, if you’re reading: Yes, it’s the same one you donated to the cause). This rocky stretch isn’t even one of the hard parts. 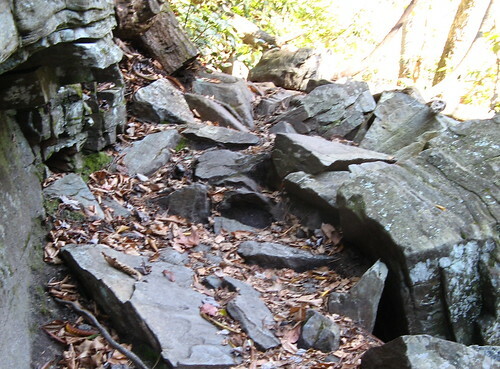 From here you go down one very steep ladder, pass below sheer cliffs, work your way over one root tangle and rock pile after another till you finally hit river level, where you can hear the falls roaring just beyond a wet stone face. A narrow path at water’s edge takes you to the other side. It’s slippery and requires considerable balance and caution to keep your boots dry, but it’s not as harrowing as it looks at first glance. 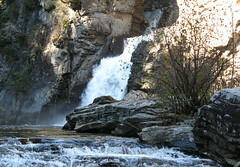 Linville Falls at the Plunge Basin. A hiking family making their way over the path I had just taken. Yeah, this is the trail. Returning is actually easy despite the climb because you have a better sense of where your feet are going, and you’re not trying to navigate with the brakes on. On your way back, this ladder tells you most of the climbing is out of the way. 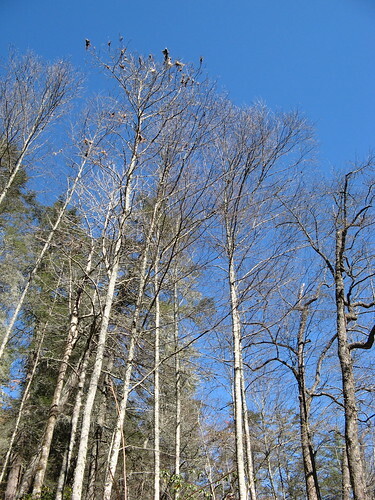 Even without leaves this forest is wonderful. Smoky Scout takes her hiking club up Hawksbill Mountain. Linvillegorge.net — lots of Gorge hiking info here. Linville Falls at North Carolina Waterfalls site. 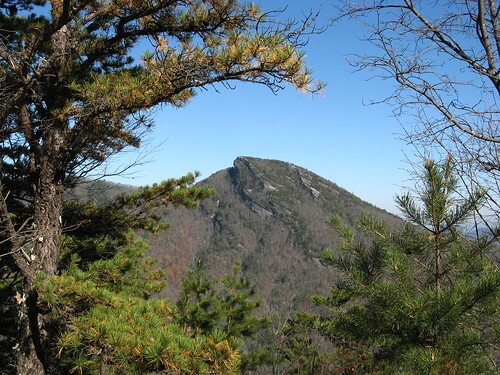 Linville Gorge fact sheet (PDF download includes where to call about permits). Sherpa Guides Linville Gorge page. I must make my way “East” one day, Tom. You are showing me there’s much better walking there than we haughty, dismissive, center of the hiking universe Westerners assume. I’m continually amazed – but not surprised – by the bounteous natural beauty you’re finding that rivals California’s! I do hillwalking in the Uk , thought that our scenery was amazing till I seen yours !!! Your pictures will make hikers of us all. They do like to name things after people…. lots of roads in the countryside are named after people with first and last names. Linville Falls should be on every ones list who want to explore the mountains and river gorges of Western North Carolina. Thanks for the photos, and for taking us along Tom! 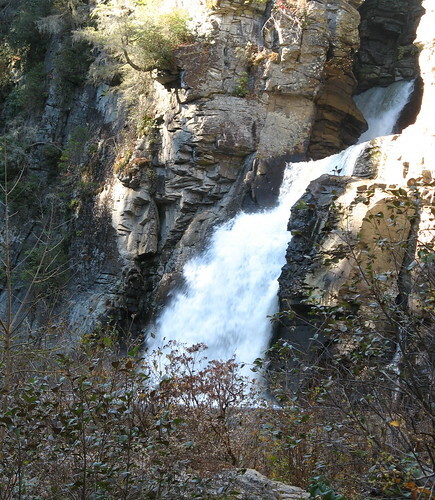 Linville Gorge Wilderness – Fun loving! Amzing pics! Would love to visit it.